I don’t have a tattoo myself, but I respect them (well, perhaps not so much those late night drunken ones). Most people who get a tattoo put some serious thought into it—given it’s one of those life decisions that stays with you—picking symbols that hold deep personal meaning for them. He neglects (at least to the extent of my own research skills) to say what the tattoo’s symbolism means to him. And, when you try to Google what it means, you get things like this National Post article talking about how the Liberals will want to downplay the tattoo. Winston Churchill had a tattoo, but it was a simple anchor graphic on his arm; pretty standard decoration for a former First Lord of the Admiralty. Mr. Trudeau spent some time in B.C. once, so he got a massive Haida raven covering his shoulder. Another famed political offspring, Caroline Kennedy, is able to credit her embarrassing butterfly tattoo to the unruliness of youth, but Mr. Trudeau got his ink just two years ago, to ring in his 40th birthday. Seriously? Churchill’s tattoo is standard, but Trudeau’s tattoo is slammed just because he “spent some time in BC once”? This is a knock not just at Trudeau, but at BC, and also at the obvious First Nations symbolism of the tattoo itself, so a knock to indigenous peoples. This is not a fly by night “embarrassing butterfly’ tattoo. This is something different. And, the fact that JT got it to commemorate his 40th birthday should make us even more curious about what it means. But, when you enter politics, certain things, like the tattoo you proudly show, become public, so I think we can do better than that. Justin’s wild, fleet footed mother also, because of her father, had ties to North Vancouver, where she and Pierre Trudeau had a hushed wedding in 1971. Justin himself lived in BC while he attended UBC for his Education degree, graduating in 1998. Following that, he taught at West Point Grey Secondary and Sir Winston Churchill (where I went myself back in the day) high schools for a few years. 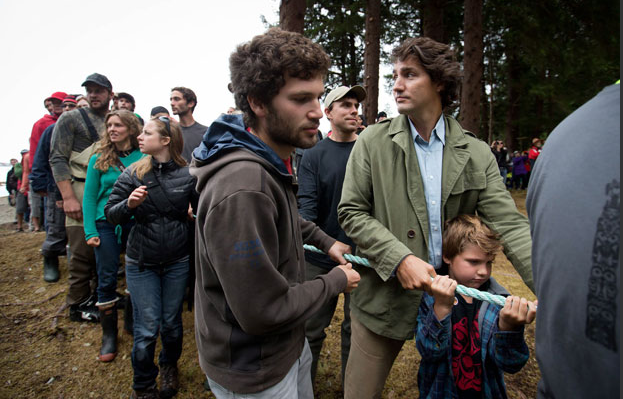 Trudeau also has sad ties to BC, where his brother died in an avalanche in Kokanee Glacier Provincial Park in 1998. Long before Justin Trudeau lived in BC as an adult, he had a particular experience in the ‘supernatural‘ province that he himself says had a profound effect on his life, that directly ties into our friend, Raven. So, the tale of the raven on JT’s arm is starting to come together. The image itself, can give us more clues. Here is the original art, by Robert Davidson, that was the inspiration for the tattoo design that was chosen by Trudeau. So, what is the mythic narrative of the Haida Raven? 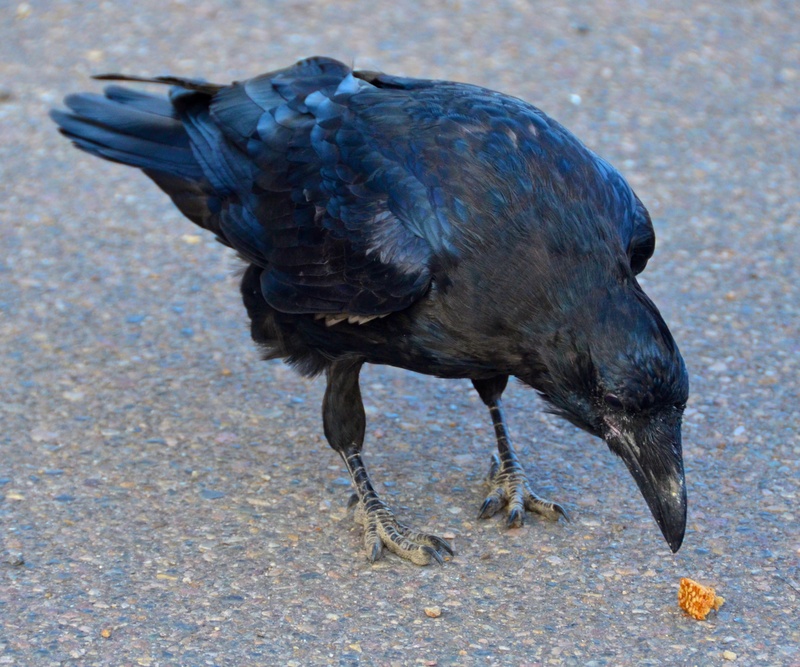 As most experts on myth acknowledge, myth has elements of truth from reality, and, if you have ever encountered a raven in close proximity, you will soon see why this bird made an impression. Living here on the west coast, I’ve been fortunate to have run into a few ravens. These are memories that stand out. Here is a shot of an old man of the mountain raven that I encountered last summer hiking up in Jasper. He flew down by the side of the road before we went up to go to a hike, so, in the old tradition of mutual exchange, giving something to the forest before you get something out of it, I made him a small offering for good luck. My most recent raven encounter was in early September, when a I was hiking with a friend up to the Bowen Lookout at Cypress Park, pictured below (unfortunately my camera died on me after taking the shot below, so I never got a pic of the birds…). While we were enjoying the view, two ravens flew flew over from the next mountain, calling loudly, and then perched in a bleached tree top. After yelling at us, they decided to come down and take a closer look, swooping down and scaring the bejeezes out of me. I had never had a raven decide to come so up close and personal before. (They usually prefer to lord over you from a nearby tree.) One of them was the biggest raven I had ever seen in my life, and when it hopped within three feet of me, its beak alone as long as my hand, and its body bigger that many of the bald eagles I’ve seen around here, I was definitely on my toes. I didn’t want to get on his/her bad side, and in that moment, a new understanding of Raven as a trickster you don’t want to mess around with crystallized for me into a new kind of understanding based on experience. But enough about my story. Back to Trudeau, and the old original story of the Raven and the sun. The Haida believe Raven is “a complex reflection of one’s own self. Raven can be a magician, a transformer, a potent creative force, sexual deviant or ravenous debaucher but always a cultural hero.” (Wiki) Well now, given the colourful tales of the Trudeau clan over the years, these sound like rather apt descriptors for a good roast. Gray Eagle was the guardian of the Sun, Moon and Stars, of fresh water, and of fire. Gray Eagle hated people so much that he kept these things hidden. People lived in darkness, without fire and without fresh water. Well now. If that doesn’t smack of a Harper analogy, I don’t know what does. It has the grey hair, him being in a position of power as a guardian of special resources, the appropriation of the common good of energy, and the secrecy and sordid darkness of it all. Several versions of the story also have fun with Raven, describing him as transfiguring into an obnoxious black-haired baby in order to trick the old chief. Something of an upstart brat, with an agenda. If anything, the title of Justin’s recent book, Common Ground , affirms that this upstart Raven Boy might actually share some of the values of citizens who care about about responsibly managing the amazing natural capital of our country in a way that considers what will be left seven generations down the line, equity in sharing benefits of its bounty, and not unfairly penalizing some with the negative externalities (like so many small communities dotted across North America face with resource development), while a few elite reap the lion’s share of the benefits. If anything, this tattoo tells me that if there is any weird, secret agenda (unlike Harper’s strange thing about Israel and Armageddon that his evangelical church believes) that Justin holds, it’s that he actually IS Raven Boy, of the Raven clan, the Canadian version of the boy Hercules, who will steal the sun back from the colonial powers to restore its bounty back to, yes the haggard middle class, but also, the indigenous peoples of this land, who have suffered in the collective shadow of colonization for so long. The democracy that most of the European settlers, and more recent international immigrants, of Canada have enjoyed, has never been their democracy.My bet is that what is behind this tattoo is that, if any Prime Minister will finally make good on the injustice of the historic cultural (and other) genocide done to the Aboriginal peoples of Canada, this will be the one. And so, before I wrap up, I’d like to mention another interesting element in our little tattoo detective story, which is how this obviously Aboriginal tattoo ties into Justin Trudeau’s true stance on indigenous rights and First Nations issues in Canada. To me (as someone with indigenous roots clouded by a colonial past), his tattoo choice of a raven spoke to me, not as cultural appropriation as I’ve seen some people call it online, but rather an actual tribute to something in the indigenous tradition of the Haida Trudeau actually identifies with, with more social and environmental connectivity than meets the eye than the fact of his parents adoption into Raven clan. I would venture that this tattoo is not just a trivial matter of aesthetics, but speaks perhaps more clearly than other clues as to Justin’s real commitment to make good on his party’s platform pledges regarding Aboriginal people in Canada, and the beautiful land that they—and we—care so much about. Given the above, my suspicion, is that, at the very least, the wily black-haired Raven Boy will have a few more tricks up his sleeve to surprise us besides stealing the election to become (if I may) “PM Raven Hair” (ok, I’ll finally acknowledge that hair) to that tribe of people we call Canadians. Let’s hope his tricks going forward will continue to be of the kind that leave most of us pleasantly surprised. Not the kind that will further etch the political cynicism—that grew steadily throughout the era of the “Old Grey Chief”—even deeper into the Canadian psyche. Even if PM Raven Hair, plans to make good on his platform promises, it wont be easy, because it’s highly likely that there are many in parliament who are more of the same ilk of what we’ve seen in Canadian politics with Harper, who represent special interests, not what is best for the people. So not only will PM Raven Hair need a few more tricks up his sleeve, we will also have to continue to have his back. Watching, voicing, acting as an engaged electorate. And in case the point comes where ol’ PM JTRH becomes as ‘hard of hearing’ as the Old Grey Chief, well then, we will just have to get our act together and vote for change again like we did yesterday, remembering that what we—the people—can bestow of power, we can also take away.